Modern cinema maintains a series of technical terms via oral tradition, that really no longer make sense. How many people really itnow the origin of terms like “Gaffer,” and “best boy?” Yes, those job titles have a clear set of responsibilities, but the origin of the term is sometimes cryptic, or humorous. Visual effects have their own terms as well, developed from a multitude of technical and artistic sources. Digital visual effects in particular rely on some nomenclature that was developed in the analog era, and truly has little meaning in current technology, but are understood in context. The term Greeblies, and its similar term Nurnies (alternate spelling “Nernies”) are often used interchangeably, understood by most, and only recently outlined in an interview with Fon Davis. The VFX community uses them repeatedly, but have little idea of their origin. An exact definition of those terms has never truly been locked down. That makes the search for them a perfect opportunity to practice some VFX Archeology, and see where history takes us! As part of a learning exercise, VFX Archaeology is practiced in this manner: First, exhaust as many extant sources as possible, and then go and ask the people who were involved. In some cases that is no longer possible, as many methods in VFX were mired in proprietary techniques for decades, and some of the practitioners have passed on. The purpose of VFX Archaeology is to educate digital artists on the history of the craft, and attempt to bridge the chasm left when the analog techniques were unfortunately thrown away. The job of the VFX Archeologist is to discover the solutions, honor the craft, and apply them to the challenges of now. As far as I can date back, greebles started with the original Industrial Light & Magic (ILM) group here in Southern California. They would call things greebles, and then they moved up to northern California, and the rest of the Los Angeles model shops were calling it Nurnies. But since they moved Industrial Light & Magic up to northern California, it brought up a NorCal, SoCal difference, so they would call those same detail bits nurnies in northern California, and in southern California it was greebles. Then some people said it wrong and that’s where greeblies came from! So greebles, greeblies and nurnies are much the same thing. Firstly, you may note that the spelling is somewhat different for the terms than at other places in this article. That discrepancy will be addressed later, but will likely not subside. Also, I think the writer flipped the descriptions of Northern and Southern California usage. The online discussion launched or added to hashtags on Twitter: #WarOfTheGreeblies, and #Greebles — admittedly I was a major contributor. The “source of all modern knowledge”, Wikipedia, was quickly consulted, and all of the online discussion surrounding the wiki entry, partially reenforced Fon’s recollection, but oddly gave credit for Nurnies to Ron Thornton, of Babylon 5 VFX — who famously said “Slap a few nurnies on it, a coat of paint, [and] walk away.” However, the term “Nernies” is thrown around makeup effects departments as well (who rarely use model parts), enforcing the alternate spelling (the spelling seems to alter depending on the writer) — but in the makeup case means pieces of latex that are rolled when dry, used as veiny structures or globby bits, etc. Evidence of the term in use for other filmmaking disciplines, intimates that the term is much older, and requires a little more research. Assuming Ron Thornton picked it up somewhere else, and his being British by birth, it was logical to start the search in the British VFX industry around the same time as early ILM. After initially publishing this article, one reader urged further research into the origination of the use of model kits altogether. That method eventually spawned all these terms, and the overall “KitBashing” term as well. 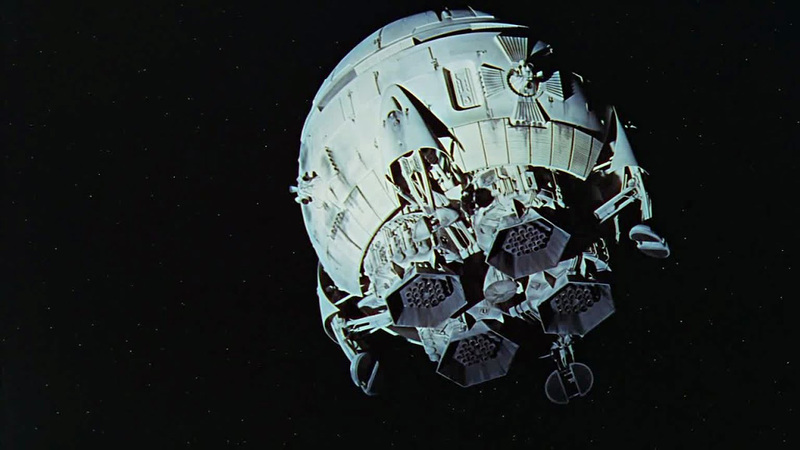 As I had suspected, use of commercial model kits for detailing predates 2001: A Space Odyssey. An excellent blog , which explains it beautifully on Gerry Anderson’s Supermarionation series led me to an interview with Derek Meddings. 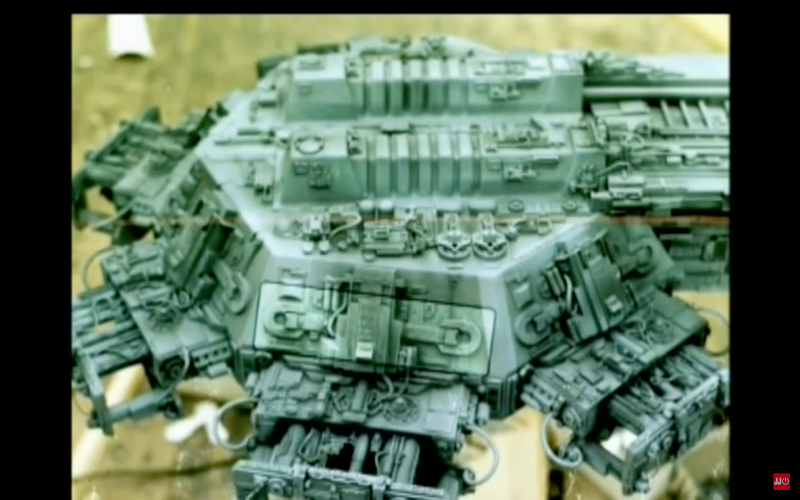 The originators of kitBashing is none other than the super-talented Derek Meddings, and his team on Fireball XL5. Everything was built in the studio, in actual fact the Americans always get the credit for using all these kits – we started it and the reason we started it was because it was cheap. Brian Johnson, who was working for me at the time, took the idea to Kubrick, who used it on 2001 and now it’s the Americans who think they came up with it. 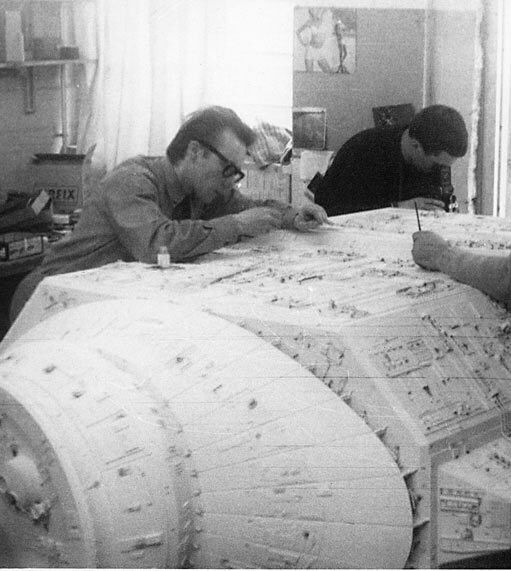 When I used to read the script, I’m talking about the early days when we were doing XL5, we couldn’t have a team of model-makers making very intricate models for us, so we used to have to create them. We used to get similar things to cans of aerosol, or squeezy bottles, or plastic bottles because they were weird shapes. If I saw a nice shape at home I used to take it to the studio, paint and spray it, and then get a box of bits and pieces and stick them on, and make it look good. Most of the things that flew were kitchen utensils, and things that came out of the cupboard at home. His full interview is posted here, and the whole site is recommended. Rather than bring clarity to the subject, this video actually began to expand the search, as it brought up another unusual term: “Wiggit” (pronounced “wig•git” in the video). 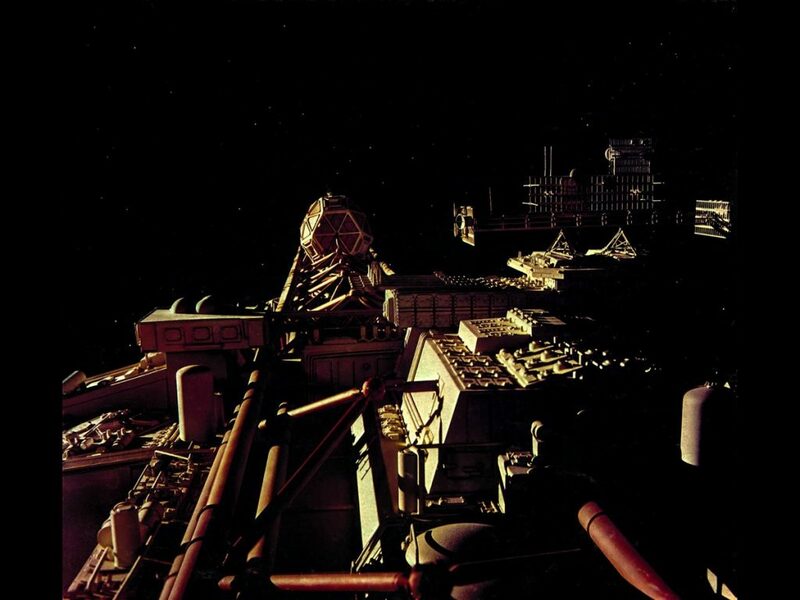 Further exploration of the web revealed a fantastic page which goes into great detail on building the Nostromo for Alien, and using the term “Wigget” [sic] there as well — with band members from Tangerine Dream helping out. Upon closer inspection of the Wikipedia post, that term was alluded to as something from 2001: A Space Odyssey, (also spelled “Wigget”) but the post provided very little information. One web site associates the term with, Gerry Anderson’s Thunderbirds , but seems to be an implied association as an afterthought. According to Martin Bower and Brian Johnson, long time British miniature makers for several movies, including Alien, the term first came into use during 2001. Well, for a start it’s always been spelt WIGGIT to us UK model makers & the term was first used on 2001: A Space Odyssey, as verified to me by Brian Johnson, who worked on the film for four years. When I was in the Royal Air Force the term Kit Bashing referred to polishing one’s No 1 uniforms [all brass buttons and belts]. When working with Derek on various Anderson puppet series we were using lots of plastic kits and I for one swapped the term Kit as in uniform for Kit as in plastic model bits. We used to buy kits from a model shop just off the Slough Trading Estate. Incidentally STE was the home to Bowie Films, Caravel Film, Gerry Anderson Productions, and Ford GT 40 (Ford Advanced Vehicles), Eric Broadly (Lola Cars), and Winkelmann Racing (Lotus F2). Robert Watts (Production Manager) and I flew to Nuremberg to the World’s Toy Fair and I bought (using Robert’s fluent German) a vast number of Faller and Vollmer plastic parts. We were given all the parts we needed via specific injection moulded sections without the need to buy kits and only using a fraction of the bits. By the time Space 1999 arrived I had a team of eager Wiggitters and a very young Martin Bower was given industrial strength glues and solvents to help him make his models keep all their ‘Wiggits’ On Alien we had possibly the best UK based Wiggitters and we hadn’t yet done a great deal of casting selected sections so many plastic kits were used but by Aliens moulding required pieces was the norm. Nurnies was not on my radar until I worked at ILM North. a USA original for sure. 2001’s primarily known American visual effects technician is Douglas Trumbull, Who has a wonderful recollection of the 2001 wiggiting. 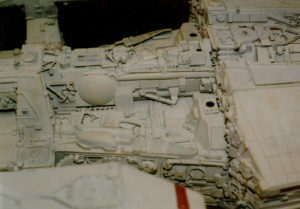 The fine detailing was made up of specially heat-formed plastic cladding, flexible metal foils of different textures and thicknesses, wire, tubing, and thousands of tiny parts carefully selected from hundreds of every conceivable kind of plastic model kit, from boxcars and battleships to airplanes and Gemini spacecraft. A delegation from the production was sent to an international model exhibition in Germany to select the best kits available. The potential British link as the source for the terms “Nurnies,” or “Greeblies,” now completely disproven, we must look to other productions in American shops as the source. Doug Trumbull later directed a film called Silent Running. 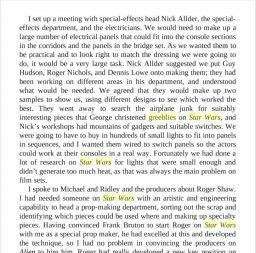 John Dykstra, who was the VFX supervisor on Star Wars worked with Doug on that film, and also founded the VFX shop Apogee soon after, where these terms were often used. It was logical to move the search there for the origin of the Greeblie and Nurnie terms, as it seemed to be an obvious bridge. 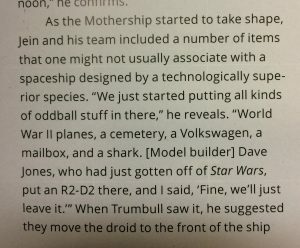 It is still widely assumed that the team at ILM only used the Greeblies term (A British set designer attributed the term to George Lucas, as you can read below), and that Nurnies existed in other parts of the community. However, an interview with John Shourt about making Battlestar Galactica, a production that happened immediately after Star Wars in the same facility, demonstrates that the Nurnie terminology was clearly used as well. The underside of the original Battlestar Galactica. Greeblied and Nurnied, with x-acto knife scoring to imitate panel lines. Not sure if that is the correct spelling, or, if it has any. I think I first heard of the term from the model makers during Star Wars. To put it simply ‘nurnying’ is the application of detail on a model/drawing to break up space and add scale. In the case of models these items are generally scavenged from model kits although some items were from actual industrial model companies. These applications must relate to what they are applied to of course… although model makers have slipped in the occasional object that doesn’t. As a joke. Greg jein attributes R2D2 to Dave Jones. At this point the discovery phase of the VFX Archeology was all over the place. 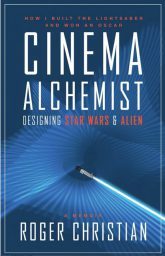 Many of the original assumptions — ILM origins, Los Angeles vs San Francisco only usage, British creation of the terms — were now in question. Several hours of searching old Starlog, Cinemagic, books, and any online resource could not bring clarity. It seems the extant sources were beginning to show some weakness. Time to ask someone else. 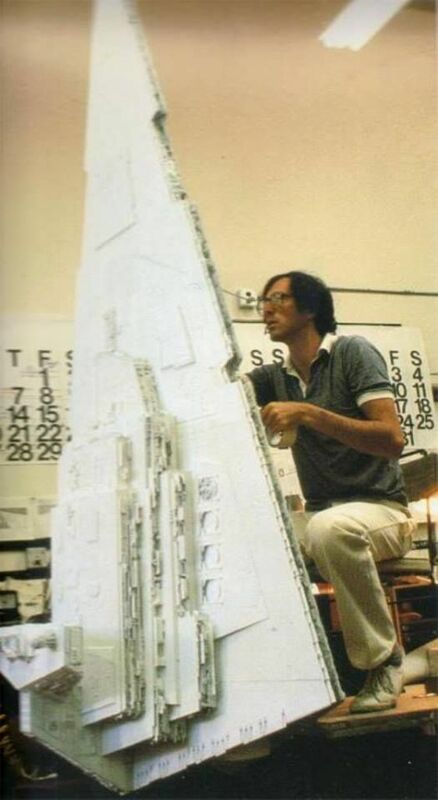 Paul Huston working on a heavily Greeblied Star Destroyer. Both [terms] were used interchangeably in 75-76 in Van Nuys. I think they were coined earlier, on Silent Running or even 2001. Dickie Alexander worked on 2001, he might have brought them along [from Britain]. One more clue pointing to Silent Running as a possible source for the term Nurnies, and not ILM. By this time on the social networks, the hashtag #YearOfTheWigget (now #YearOfTheWiggit ) attached itself to the discussion, and online searches mentioned somebody glueing themselves to a model in an old Cinefex article. A quick search of the impressive Cinefex back issue catalog (Which you should all buy!) provides the tale of Richard “Dickie” Alexander (the same one mentioned by Paul Huston) glueing his hand to the model, on Silent Running, during a “shake and bake” session (one more term to add to the list). For those who missed the 1970s, ‘Shake & Bake’ ads ran on television quite often, selling a chicken seasoning placed in a bag, and shaken. The chicken parts removed with all the flavor goodness on top, ready for cooking. You can see the analogy of spreading glue on a model, and rolling it in parts. My next source was Mark Stetson, who among many jobs as miniature effects supervisor, was Visual Effects supervisor on one of Science Fiction’s greatest films, The Fifth Element. 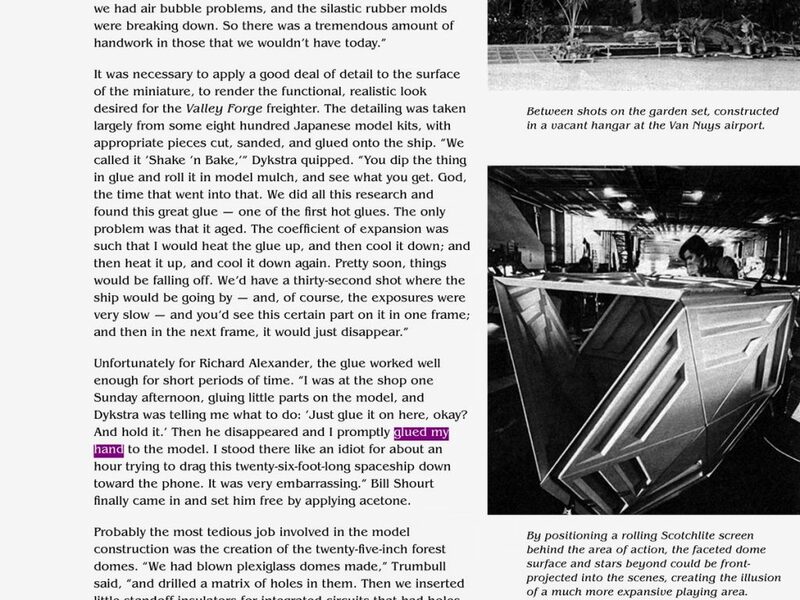 He claims that both terms were in use in 1978 (though had not heard of Wiggits), and once more pointed the finger at Trumbull Productions’ warehouse in Canoga Park (which later became Future General Corporation in marina Del Rey for Close Encounters) — Doug Trumbull’s VFX shop for Silent Running. Mark was nice enough to include Jim Dow in the discussion. 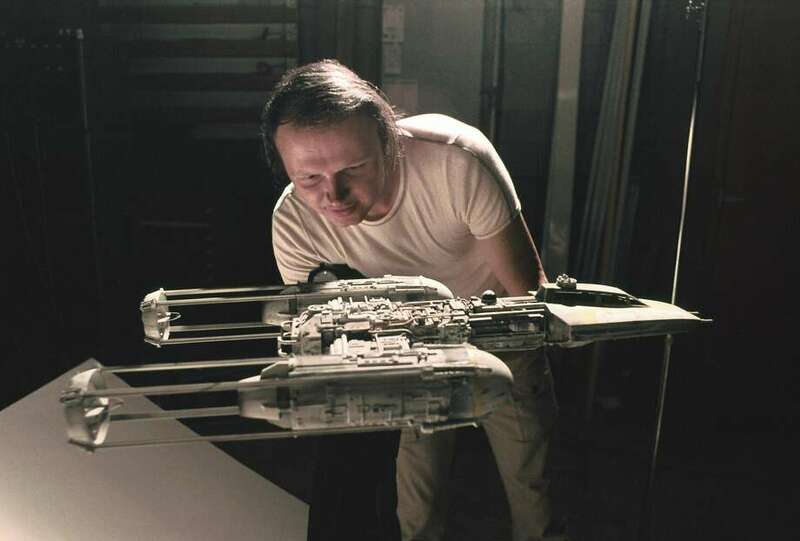 Jim Dow working on Star Trek the Motion Picture, and Greeblied final model. James “Jim” Dow is a model maker whose career similarly spans that of Paul Huston’s. Star Trek, Close Encounters, and Carl Sagan’s Cosmos are all in his resume — and he was one of the model makers on Silent Running. Greeblies and Nernies [sic] were in common use during building of the USS Valley Forge for Silent Running. Greeblies and Nurnies were detail added to enhance. Many of the original crew on Silent Running went on to ILM, Apogee, Magicam, etc etc…The terms were already in common use (in Art School in the 60’s) before those companies were established, the terms came with the modelers.…….and addendum, it might have been spelled ‘Nernies’, never saw it written, just used the term. Never ‘Gerbils’ [which is what Apple’s spell check keeps substituting], always ‘Greeblies’. Finally a reasonable answer to the origin of those popular terms. As well as an ‘almost-vote’ for the alternate spelling. [Later discussions with Mark and Jim favor “Nurnies” as the official spelling]. Thus: Greeblies and Nurnies are a set of LBSC terms which crept into the special and visual effects realm, and gathered a life of their own. Although this art college used it as a way to describe detail, it is far more complex than that in visual effects, as it is more about re-purposing items, or adding scale. Maybe we need a cleaner definition. It’s basically using parts in ways you’re not supposed to use them. So again, it’s about speeding up the process of making a model. The Wikipedia definition roughly agrees with this description, as well as kit bashing, as well as Derek Medding’s thoughts on its original usage. It is a way to speed up the detailing process, and suggest scale. However the actual practice often goes beyond random scattering of detail, and actually changes the perception of certain shapes by altering their context. It can provide scale, but when applied to set decoration it creates a sense of function — making scale a relative term to the application. Definition (2): In makeup Effects, pieces of rubber and random bits used as viscera, tendons, and other organic detail. Example: A hubcap from a car, placed on a spacecraft is an escape hatch. 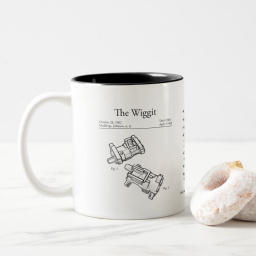 In use: “Wiggit-izing,” “Greeblie-ized,” “Nurnie-it-up,””Nurnying,” “Shake and Bake,” “Kit-bashing,” “Wiggiters,” “Wiggitry”. This definition is open to change, and this article will update as new evidence comes in. Everyone has their favorite way of spelling these terms. The metric I am using is to find the oldest, and most used terms, in that order. The definition above attempts to identify the variations, and usage. Already some of my favorite terms have changed to reflect that limitation. Spell it how you wish, add a letter or two. Greeblie-ize it as you see fit. The terms Greeblies and Nurnies, have long been understood, but thrown around as mere nonsense, motivating no one to fully track their origins (until now). Despite being an LBSC (Long Beach State College, Now CSULB Calif State University at Long Beach) term, they have been redefined in the service of Visual Effects, and should take place as part of our rich heritage due to the VFX community’s development of the “kit-bashing” craft. But rather than settle on this research as the final word on the subject, it is important to continue to reveal the sources of these minor, though impactful innovations. This research alone introduced us to one of our new favorite words, but ironically one of the oldest — Wiggit. Digital visual Effects owe much to a great history of traditional visual effects, both of which seem to do little work passing along and preserving their history. As visual effects and makeup effects creep into pre-production, production, post-production, and marketing, perhaps keeping more precise records makes some sense. It is a heritage we can own, and share. Be proud of it, and honor the craft. This has been another journey in VFX Archaeology. I thank all who participated in the Twitter Discussion, and especially Paul Huston, Mark Stetson, and Jim Dow, Martin Bower, and Brian Johnson for their time, with  Alec Gillis providing some insight into the makeup effects. Together we evolved #WarOfTheGreeblies to the #YearOfTheWiggit. Hopefully making Lewis Carroll proud. Special thanks to John Knoll, and his extended contact list. 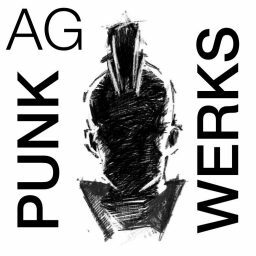 Order related products from this article at the ag_punkwerks store. I allude to it in the definition, but did not include it directly. Given the “shake and bake” terminology, I will update the article to reflect the term earlier. I know “kit bashing” has been around, but it is a good opportunity to research it. Ian, the article now reflects changes that expand its scope, based on your thoughtful input. Thank you! Updated with more information on use of Wiggets on ALIEN. Worth digging through the links on that one! Jim Dow altered the spelling of “Nernies” in his original response, saying that “Nurnies” was a preferred spelling. Currently “Nernies” is being used to denote the use of the terms in makeup effects — until newer information from older sources changes that. Alec Gillis nicely provided some clarity on the use of the term “Nernies” in the Makeup Effects profession. Martin J. Bower, who worked on several Gerry Anderson shows, provides clarification on the appropriate spelling of “Wiggits,” and the direct association with 2001: A Space Odyssey. The spelling and references have been cleaned up. Added a direct quote [with permission] from Martin Bower on Wiggets in 2001: A Space Odyssey. Also changed the organization to reflect the contributions of Derek Meddings in more chronological order. Updated the R2D2 history involving Dave Jones. That is an oral tradition, whereas the Close Encounters Documentary on Special Effects gives that credit to Dennis Muren and Greg Jein. Updated article with response from Brian Johnson about the history of Kit-bashing, and Wiggits. Updated the 2001: Space Odyssey section with information by Douglas Trumbull. 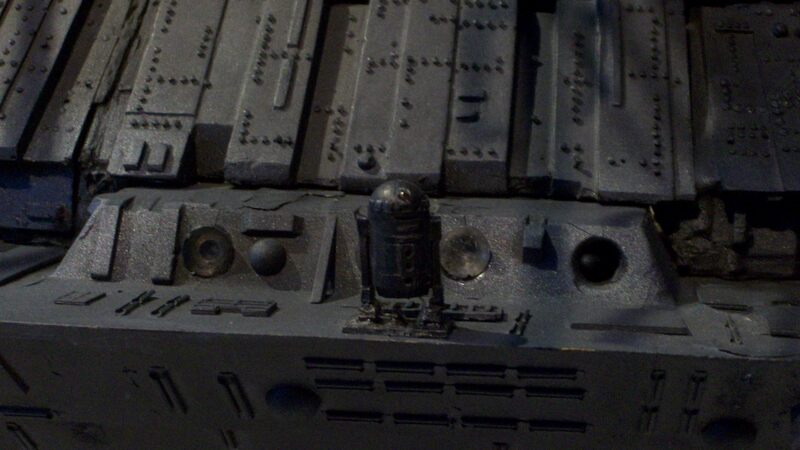 Updated attribution of R2D2 model on Close Encounters to Dave Jones.